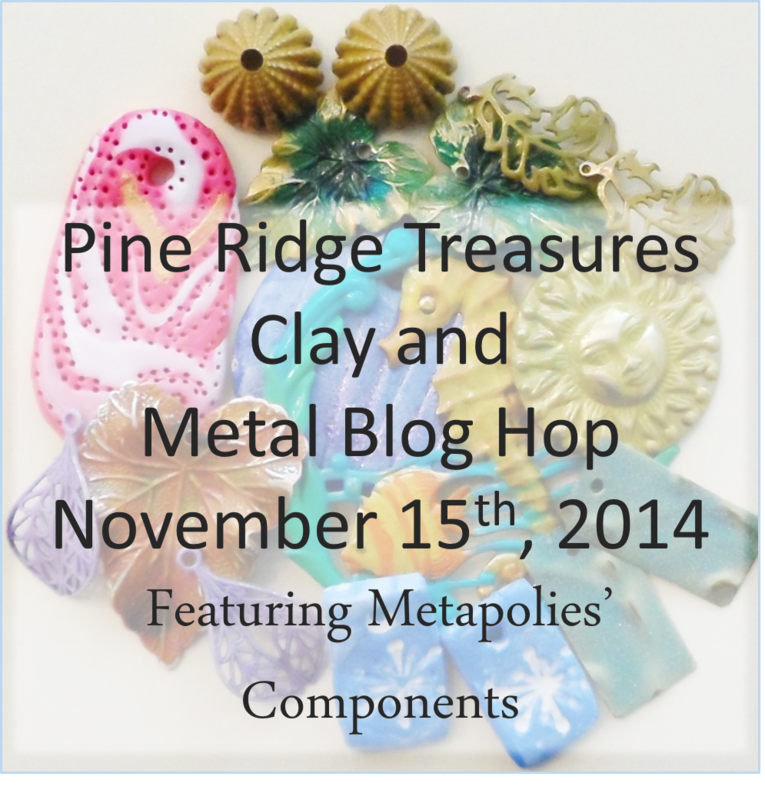 One of my favorite blog hop hostesses is Lisa Lodge of Pine Ridge Treasures so it is almost automatic for me to sign up for her hops. This one was especially enjoyable because it features Sheryl of Metapolies. 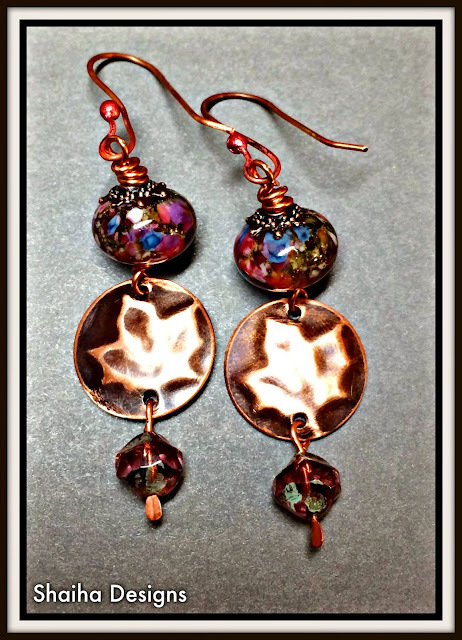 Sheryl works in polymer clay but what I really love is the magic that she performs with patinas on metal. As I have said, Sheryl does clay but I love her metal and I was lucky enough to receive some beautiful patined leaves along some Tiara crystal and green glass beads. I was really thinking about trying to make up a necklace but those leaves were demanding to be made up into a pair of earrings. I fought it for a while and finally gave in. I ended up not using the green beads because the hole was just too tiny for the wire I was using so instead I added in some more Tiara crystal. And I like I said, I love the various metal components that I can pick up from Metapolies so I made up another pair. 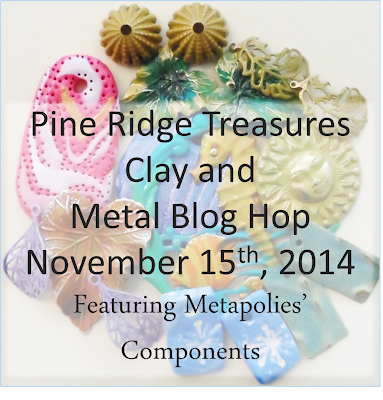 The brass discs are from Metapolies and the lampwork beads are from StudioJuls. Both of these pairs of earrings are currently for sale at Shaiha Designs. Now that you have seen my humble offerings, be sure that you check out what all these other wonderful designers have come up with. Wonderful sparkling, bright earrings, I love them. You are so spot on - Sharyl does an amazing job with her patina on metal! Love those earrings, especially the second pair - that metal disc with the leaf and those lampwork beads are so pretty! Your earring designs are great! 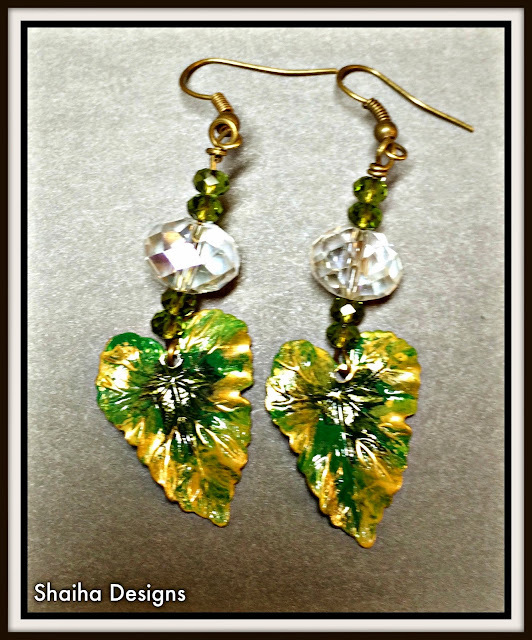 Another fun thing about this hop is to see what others do with things I've eyed in Sharyl's store like these leaves! OOH - I am loving both of these earring designs, Shaiha! Sharyl's metal pieces are also my favorites. 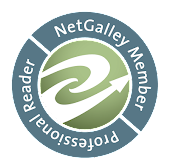 Thanks for being in the hop! Your earrings are so pretty! I love the patinaed leaves too and you really did a wonderful job finding just the right crystals to highlight them. I also love the extra pair you created, Sharyl does create wonderful components! The leaves are so pretty, I love both pear of earrings. Wonderful job. Beautiful work. I love the green earrings! So regal looking....great job! 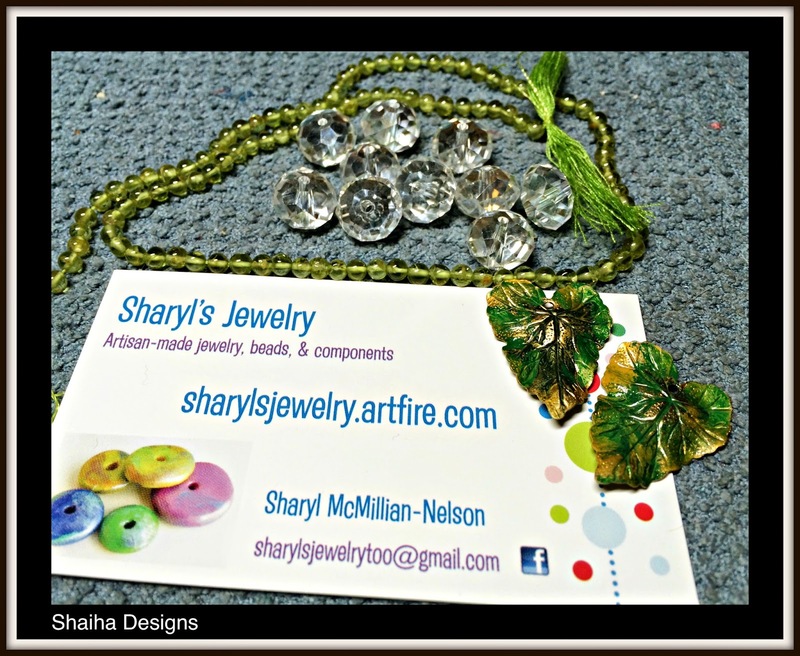 The leaf set you received from Sharyl is stunning! You paired them perfectly with Lisa's brilliantly glittering crystals. Yup, I heard 'the call to be made into earrings' all the way over here..they had to be earrings! The second set is equally beautiful.